When we think about about vacation in Italy we immediately think about religious architecture, art and about that delightful pizzas and pastas that we are going to enjoy while looking at a vespa a few metres away… But Italy is also about sun, beaches, the relaxing lapping of the waves and the warm sea temperature. 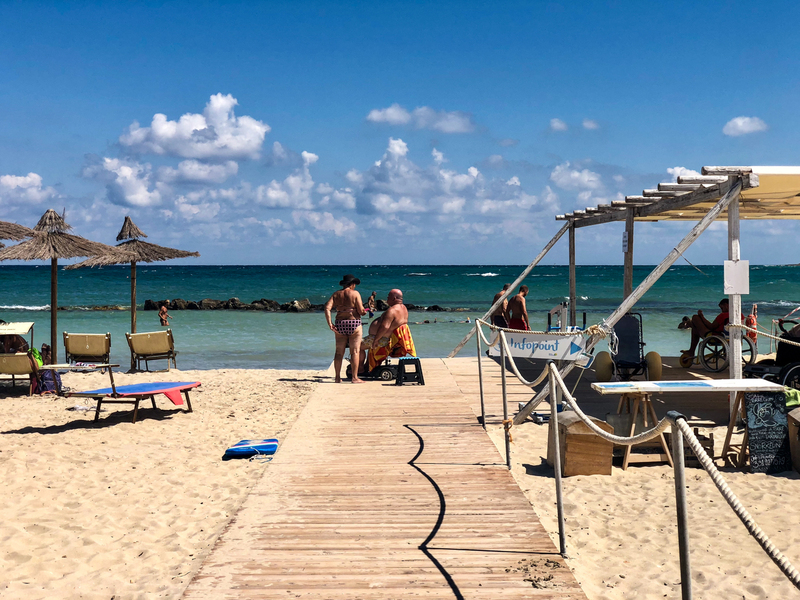 Talking about beaches, Apulia is quite a good destination to sunbathe on some of the most beautiful beaches of Italy and swim in crystal clear waters. The Italian Adriatic and Ionan coasts are marvellous but it is not really easy to find wheelchair accessible beaches. As often, only a few beaches are fully accessible and equipped for people for reduced mobility. But no worries, even if sometimes we had some hard time finding one, there are wheelchair friendly beaches in Apulia and I must admit, there are more of them than what I thought. Eventually, the most difficult part is to find a free wheelchair accessible beach. Indeed, Italian seem to like private equipped beaches that they call “lidos”. But no worries, here is a list of many beaches I went to, sorted by accessibility grade. Only one is not free. Located 25 minutes by car from Ostuni, Torre Guaceto beach is my favorite beach in Apulia. Not only it’s an astonishing beach with calm and clear waters but also this is a fully equipped and accessible beach for wheelchair users. Plus, it seems that it is a really good snorkeling spot to admire some fishes but unfortunately I can’t confirm as we didn’t have snorkel gears. At Torre Guaceto beach, you will find many beach wheelchairs and even one you can use to go into the water. Those Italian beach wheelchairs are called “job chairs”. There is also an adapted restrooms for people with reduced mobility and a boardwalk to reach the sea easily. There are only about 3 to 4 metres (tide dependent) between the end of the boardwalk and the Adriatic sea. Normally people have to park their cars a few hundred metres away in a parking that costs 5 euros per vehicle. However, disabled people can be dropped just in front of the beginning of the boardwalk and their carers can park the car a few metres away. This way we don’t even have to pay the parking. Torre Guaceto beach is fully accessible and equipped for wheelchairs users. If you would like to go for a dip between two churches visits without going too far away from the city historical centre, Otranto beach is perfect. This beach is very close to the old town and perfectly equipped and accessible for wheelchair users. A plastic pathway leads to the sea and beach wheelchairs and parasols are available for free for disabled people and their caregivers. Lido Morelli is the only beach I listed that you have to pay to enjoy. It is a 15 minutes drive from Ostuni so it is a good location to enjoy a sunbath or a swim before or after visiting “the White City”. The lido is equipped with job chairs and a boardwalk leading to the sea (ending less than 10 metres away from it). When Franck and I went at this beach the lifeguard was paying close attention to the needs of disabled people and their caregivers. So feel free to ask the lifeguards for any help. At the lido entrance there is a disabled parking space (do not go in the main parking) and a restrooms for people with reduced mobility but there is 2cm edge which is quite annoying. Beeing in a wheelchair, we don’t have enough space to manoeuvre or build up momentum. Regarding the fees: whatever the time you will spend in Lido Morelli, a day costs 20 euros for two people with two deckchairs and a parasol. Lido Morelli, a fully wheelchair accessible beach but not a free one. There are no job chairs nor boarwalk at Porta Vechhia but, nonetheless, this beach may suit some disabled people needs since it is easy to access thanks to a small ramp leading directly to the beach. Plus, the beach is quite narrow so we are always close to the sea. This beach can be a good deal for people who can walk a bit as there are only a few metres between our towels and the sea. Porta Vecchia is located in the centre of Monopoli so there is no need to take the car to reach it if you are visiting the town and want to go for a refreshing dip. Nonetheless, for car users, there are two disabled parking spaces at the entrance of the skate park which is only a few metres away. You only issue might be to find a spot to lay your beach towel as this beach is really narrow! Surely the most beautiful beach you will find inside a city centre in Apulia. Quite hard to resist, with its turquoise crystal clear water and the plastic pathway easily leading to the sea! Before reaching this pathway you will need to go down a steep slope even if, apparently, it is possible to park cars in disabled parking spaces at the bottom of it. From there you just need to go through a few metres of dry grass to reach the plastic pathway. If you did succeed resisting the swim call, you can still come back during the evening to admire a lovely sunset on the sea horizon. Torre Sant’Andrea is located on the coastal road between Lecce and Otranto. Surrounded by a wild rocky coast, some small caves and facing boulders emerging from the sea, this beach looks like one in a postcard! Regarding accessibility, there is a disabled parking space along the beach and a concrete slope almost reaching the sea. If you get hungry you can have a lunch in the restaurant Babilonia, just near, which is wheelchair accessible. However, there are no beach wheelchairs nor adapted restrooms. View from the babillonia restaurant on the Sant’Andrea beach. Located a few kilometres away from Sant’Andrea, Torre dell’Orso is a lovely beach spreading between two cliffs. The colour of the sea is really surprising, intensely blue and at the same time incredibly clear. Even with some waves and with water up to waist level, we can still see the bottom! Along this beach there are many lidos but if you want to avoid paying you can take the boardwalks leading to the lidos and take a spot between two of them. No worries, many people do the same. Unfortunately bathing in those clear waters is not possible for everybody as Torre Dell’Orso is not equipped with job chairs. Plus, I would recommend to have a strong carer because there is a very step slope to go down after parking in the main street on one of the disabled car parking spaces. If you would like to avoid going down this slope, there is a small street running along the lidos entrances where you can dropped people but unfortunately it is not possible to park here. After that, you just need to roll on the boardwalk to cross the dunes to reach the beach. The boardwalk crossing the dunes and leading to Torre dell’Orso beach. Located 10 minutes away by car from Polignano a Mare, San Vito is a tiny cove unknown by tourists. So that is the perfect place to enjoy a sunny chilling afternoon, sharing the beach with just 3 or 4 Italian families. There is no disabled car space around but it is still easy to park close to the beach. However the beach is not wheelchair accessible as there are four big steps to reach it. Franck enjoying the first minutes admiring the Adriatic sea. Near to Torre dell’Orso and Torre Sant’Andrea, Roca Vecchia is one of the most well-known tourist sites along the Italian Adriatic coast. As soon as we saw the “Grotta della Poesia”, we understood why. Sometimes nature is so dazzling! But unfortunately nature might also be too rough for disabled people: Roca Vecchia is very difficult to access. Impossible to get close to the “Grotta della poesia” without rolling on the back wheels with another person’s help. Plus, it is clearly impossible to go for a swim in this cave as either you have to jump from the cliff or to go down by using the stairs carved in the rock. Anyway, considering the crazy number of people bathing here, it’s surely not a relaxing moment and admiring the cave from the top of is definitely the best solution! Roca Vecchia. Magnificent but not wheelchair accessible at all and crowded. If you would like to have more information about the architectural and historical treasures of this Italian region you can also read My wheelchair travel in Apulia, Italy: Terra di Bari and Itria Valley and discover our travel itinerary and budget in Apulia.